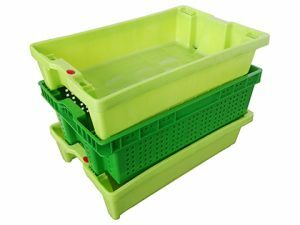 Division responsible for manufacturing reusable plastic crates made with high density polyethylene (HDPE). Wide variety of sizes and models which can be combined freely in order to offer the ideal solution for the logistics of food products. 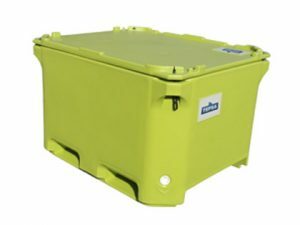 With roto-moulding technology or by means of plastic welding, we make all kinds of bins and containers. Equipped with a wide variety of accessories such as lids, wheels, grids, gates, etc. 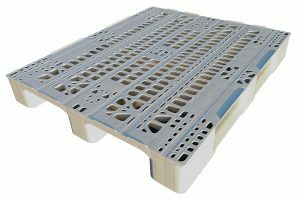 Reusable food grade pallets with 80×120 and 100×120 cm dimensions, with smooth or perforated base. Also available with recycled material, they are the most cost-effective and environmentally friendly option. 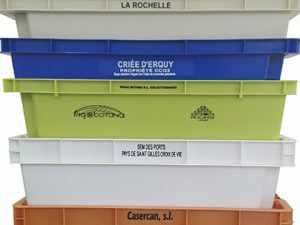 Our product range includes a wide variety of accessories and customising options for our crates, lids, carts, coloured buttons, text marking and ink images or by thermal printing, etc. A stable column is guaranteed, even in the most extreme navigation or road transport conditions, due to their nestability between feet and seats. Designed according to the principles of the Packaging and Packaging Waste legislation, guaranteeing respect for the environment. Make it easier for them to be washed and disinfected.